Lincoln MKZ Brakes! 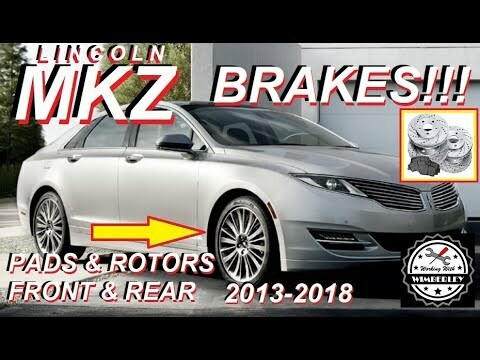 Lincoln MKZ Brakes! Lincoln MKZ Brake Pads & Rotors or Ford Fusion! Covers 2013 2014 2015 2016 2017 & 2018. EASY Step by Step Front and Rear Brake Pads and Drilled & Slotted Rotors Tutorial! I will show you how to remove and install the brakes and rotors. Easy step by step installation and removal tips. Instructions also apply to other cars! MAKE SURE TO PUMP BRAKE PEDAL BEFORE DRIVING! This is a how-to video for the “Do-It-Yourselfer” working in the home, driveway or garage. No fancy or crazy expensive tools. I’ll show you step by step how to get the job done! Due to factors beyond the control of Steven Wimberley & WorkingWithWimberley, I cannot guarantee against improper use or unauthorized modifications of this information. Steven Wimberley & WorkingWithWimberley assumes no liability for property damage or injury incurred as a result of any of the information contained in this video. Use this information at your own risk. Steven Wimberley & WorkingWithWimberley recommends safe practices when working on vehicles and or with tools seen or implied in this video. Due to factors beyond the control of Steven Wimberley & WorkingWithWimberley, no information contained in this video shall create any expressed or implied warranty or guarantee of any particular result. Any injury, damage, or loss that may result from improper use of these tools, equipment, or from the information contained in this video is the sole responsibility of the user and not Steven Wimberley & WorkingWithWimberley. Can you tell that the brakes need to be changed WITHOUT taking off the wheels??? My brakes stop on a DIME! And they don’t squeak or grind.. but the mechanic told me my brakes are sooo bad that it’s dangerous! PLEASE let my know… because if he took the wheels off without my permission to check brakes when that’s not why I brought it in he’s gonna have a problem! What about resetting the dash service light? I am doing this tomorrow, great video…should i pump the breaks once all pads are installed or is this only required for the front pads? and do grease needs to added to the rear pads also to avoid squeaks? Nice video. Very helpful. Any torque value for the bolts? I thought you can retract the caliper piston electronically.. I'm planning on doing this myself some time today on my 13 awd.. Thanks for the video though very clear and informative.